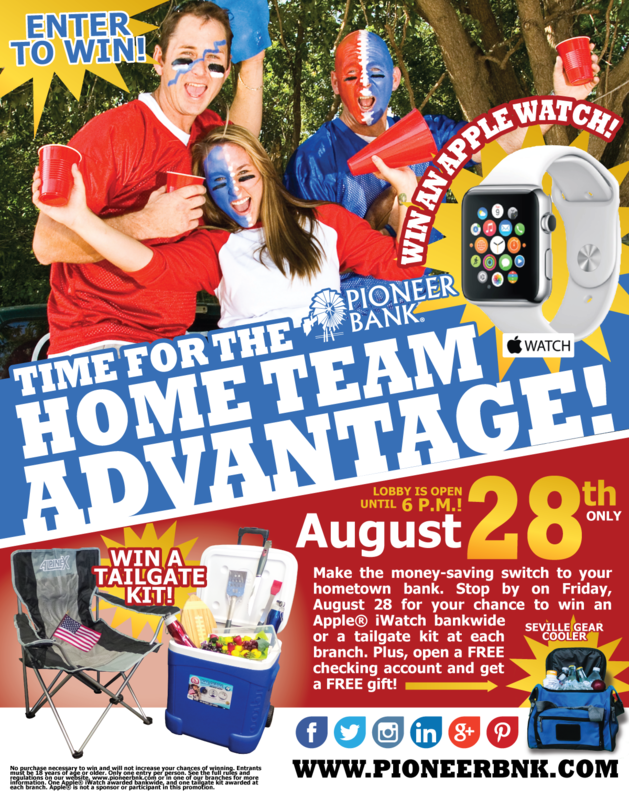 Pioneer Bank is excited about giving our customers the PIONEER BANK HOME TEAM ADVANTAGE on August 28th!! If you are already a customer, join us for an awesome day of fun and prizes! If you haven’t yet found what the PIONEER BANK HOME TEAM ADVANTAGE can do for you, then stop in to your local branch to learn more! Every branch is doing something unique and amazing! With products like Completely Free Checking, Free Internet Banking and Bill Pay, Mobile App, Mobile Deposit, Mortgage Loans, Consumer Loans, Commercial Loans and so much more, you are sure to see what the Best Community Bank in the region has to offer. Our customers are our family and we do our best to help them every day! 9:00 a.m. – 6:00 p.m. – That’s right, we are staying open later to be sure to give all of our customers and future customers time to come in and open an account or enter to win! NO PURCHASE OR PAYMENT OF ANY KIND IS NECESSARY TO ENTER OR WIN. The “Get the Home Team Advantage” contest is sponsored Pioneer Bank (“Sponsor”)This contest is governed by these official rules (“Official Rules”). By participating in the contest, each entrant agrees to abide by these Official Rules, including all eligibility requirements, and understands that the results of the contest, as determined by Sponsor and its agents, are final in all respects. The contest is subject to all federal, state and local laws and regulations and is void where prohibited by law. Any questions, comments or complaints regarding the promotion will be directed to Sponsor. ELIGIBILITY The Contest is open to Pioneer Bank customers who are legal residents of New Mexico and Texas where not prohibited by law, who are eighteen (18) years of age or older at the time of entry prior to the beginning of the Contest Period. Sponsor has the right to verify the eligibility of each entrant. WINNER MUST CLAIM THEIR PRIZE FROM THEIR NEAREST PIONEER BANK BRANCH LOCATION WITHIN SEVEN (7) DAYS AND AGREE TO A PHOTO OF THEM RECEIVING THE CARD TO BE USED ONLINE AND SOCIAL MEDIA. If the winner does not pick up the prize within seven (7) days, they forfeit the award. The Apple Watch will be mailed to the location and can be picked up at a later date. CONTEST PERIOD The contest runs August 28, 2015 ONLY. (“Contest Period”). All entries (submissions) must be received on or before the time stated during that submission period. Sponsor reserves the right to extend or shorten the contest at their sole discretion. HOW TO ENTER You can enter the contest by filling out an entry form and placing it in a designated box at branch locations. Tags: advantage, apple watch, august, best bank, big event, home team, prize, tailgate. Bookmark the permalink.